We’ve had our KTM 300XC-W TPI test bike for months now and it’s slowly evolving into a very different bike. 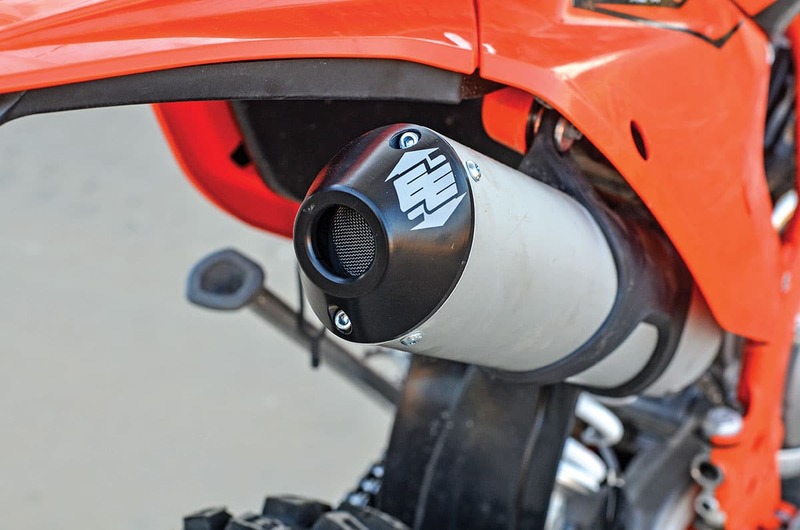 To ride it in some of our testing areas you must have a spark arrestor, and since the machine comes with an excellent, albeit straight muffler, this was our lone mod to the power side of the 300. Most of our staff considers the power output as close to ideal. In some circumstances there was a lean spot or tinny portion of the performance that the higher-end riders felt. We are in the midst of testing both ECU mods and possibly some injector updates, but it isn’t part of this piece. Our major thrust this month was to get the suspension to react and embrace more than a slow-speed rocky river bed. We want it to work in whoops, in craggy rocks, off fallen logs and higher-speed G-outs. In stock trim the XPlor fork is plush, but it dives hard under braking, wallows in the sand, despises whoops and everyone over 175 pounds made the bike look squished and low. Our second goal was to fit it with some of the hardware to ward off customer abuse due to extreme conditions. This includes guards, tires and flat fighting. Overall, every mod we bolted on or had modified performed supremely. Up front we want to thank Kreft Moto Suspension, Enduro Engineering, TM Designs, Bulletproof, E-Line, Tubliss, PT Guards and Goldentyre for helping to equip this steed. Kreft Moto completely alters the landscape within the bowels of the WP Xplor fork. 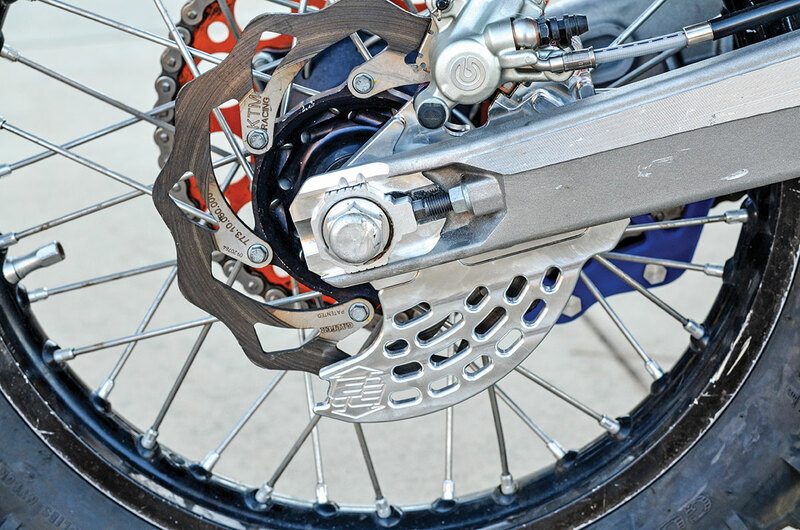 They redistribute the compression damping between both legs and a low speed compression adjuster to the left fork. Up top the left side features the Revalve Adjuster which makes noticeable changes in the damping and the right side controls the rebound. The shock mods mainly focus on getting the damping action to match the fork, and the X-Trig preload adjuster is a great addition. 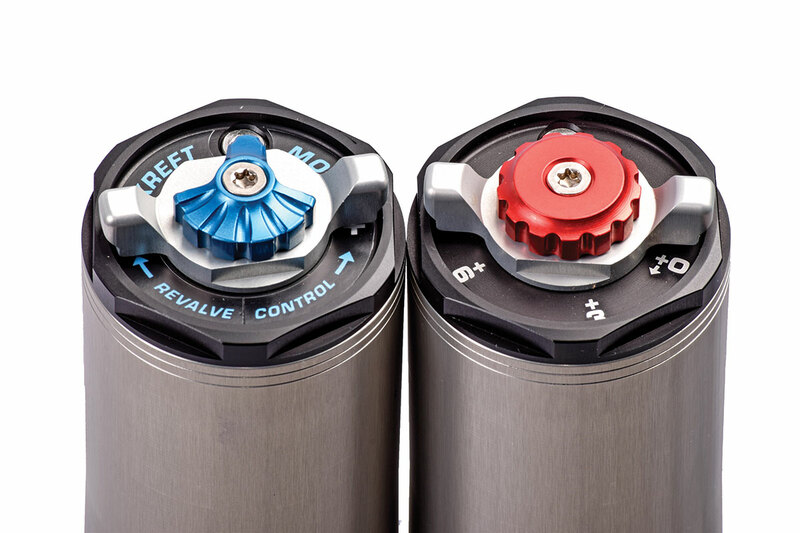 The WP Xplor fork was introduced in 2017 and replaced the open chamber design that was introduced in ’07. It features a simplified adjuster design, putting the compression on top of the left fork and the rebound on the right. On the good side, it’s plush at slower speeds and the access to the adjuster is simple. As we have stated before, the negatives are excessive diving under braking, harsh on square-edged hits, a wallowy feel at speed and it bottoms too easily. 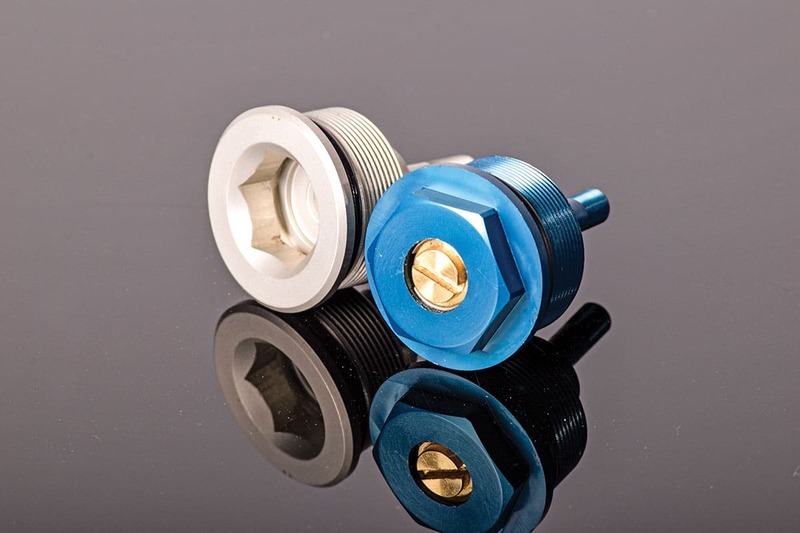 Kreft replaces the standard compression adjuster, stating that it lacks shims, is not speed-sensitive and cannot produce the necessary low-speed damping needed. Kreft also notes that the drilled holes in the left cartridge are an attempt to reduce fork harshness. Kreft replaces the left leg’s compression adjuster with a mid-valve piston and shim stack. They redistribute the damping between both legs (for hydraulic efficiency) and then fit it with their re-valve control adjuster. Finally, a traditional compression adjuster is added to the bottom of the left fork leg, and they seal the holes in the left cartridge. The re-valve control offers a huge range of adjustability and affects the low-, mid- and high-speed damping. Kreft’s new lower left-leg compression adjuster provides additional adjustment of low-speed compression damping. Kreft then sets up the valving to the rider’s skill level and the spring rate to suit their size/weight. 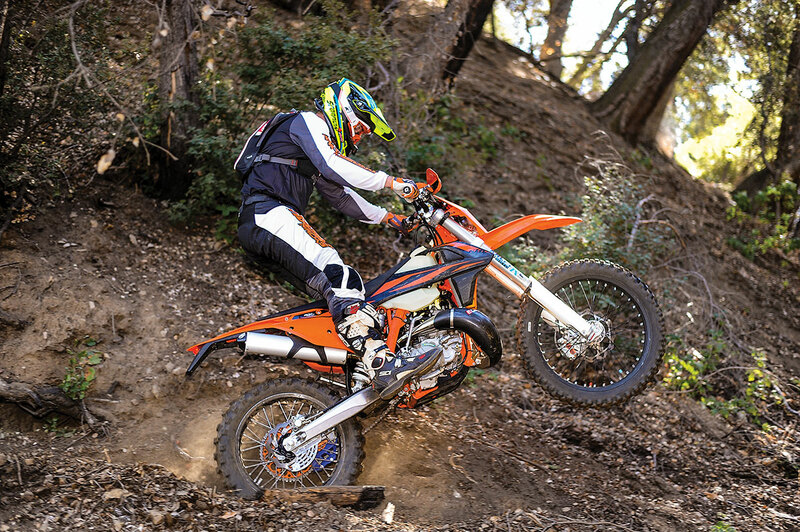 Enduro Engineering’s lower fork guards offer strong protection from rock abuse. 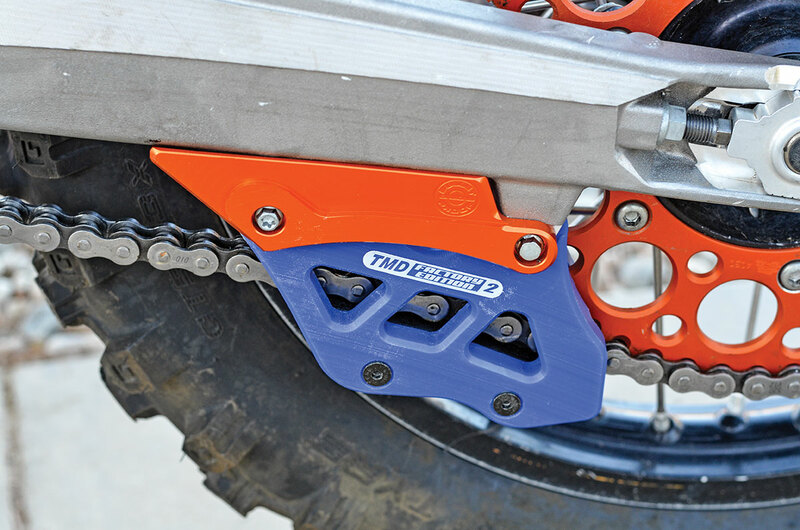 We fit up a TM Designs chain mated to a Bullet Proof swingarm stiffener making it almost impossible to derail a chain. 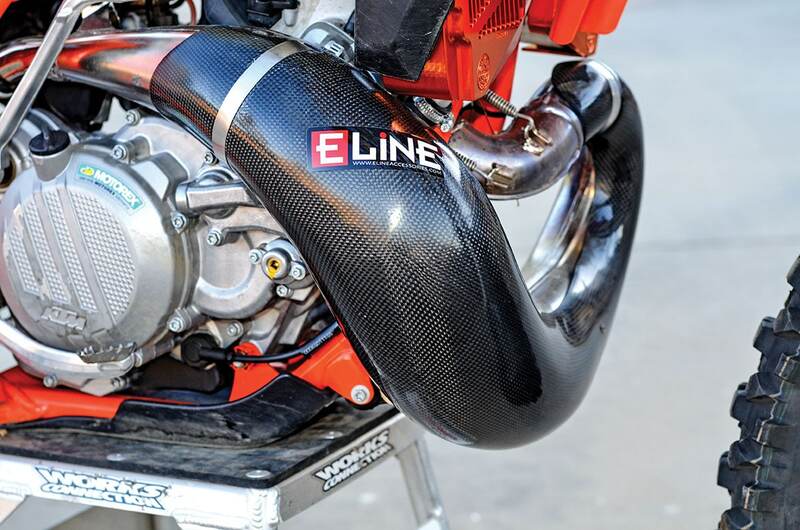 E-Line’s carbon fiber expansion chamber guard wards off belly hits to the exposed system. The advantages of the PDS design is that it’s linkless, is simple, has fewer moving parts, far better ground clearance and it works very well on cobby terrain. The progressive part of the Progressive Damping System (PDS) is a smaller-diameter secondary piston that enters a matching cup at the end of the shock stroke. It produces additional compression damping when this piston enters the cup. This design is an update to the previous-generation PDS shock, which used two pistons of equal diameter and a needle to engage the secondary piston. When mated to the Xplor fork, there is a balance issue, as the shock is stiffer than the fork. The feeling is that the shock overrides the front control and action is a see-saw affair, so a planted feel is a pipe dream. Kreft’s main goal out back is to get the systems in sync. The 46mm body on the WP unit holds less fluid, but Kreft says that for most riders this won’t be an issue. 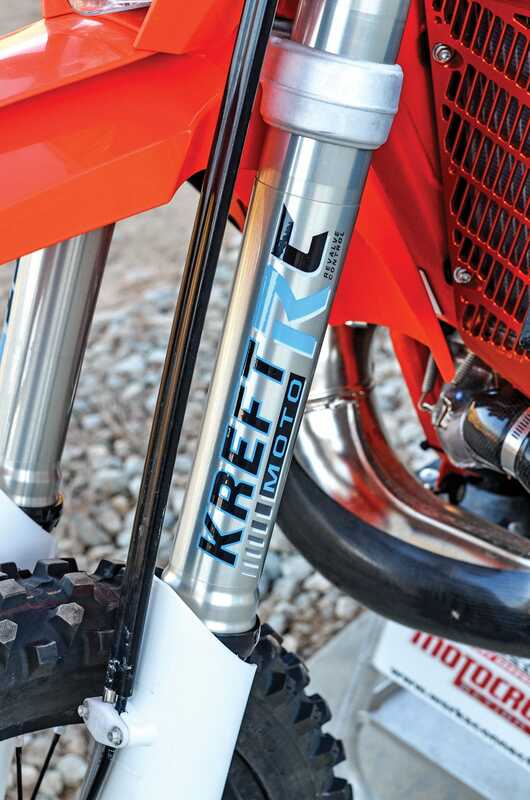 Kreft re-valved the Xplor WP shock so that it would react to rider input to the fork setup in a balanced fashion. Also, the springing of the shock is critical. 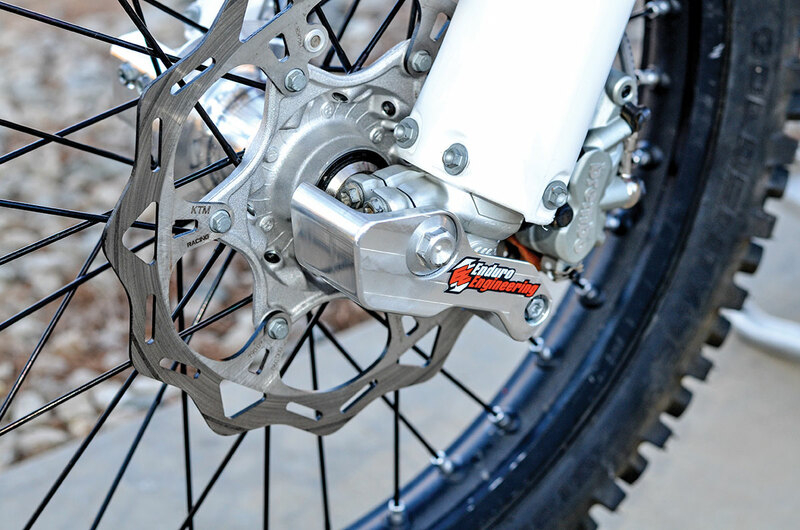 The standard Xplor shock uses a progressive spring, and Kreft uses the setup to match the rider’s weight. They say that the amount of spring rate progression is very important and recommend springs with a progression curve similar to the OEM springs, which span a modest range of 6 N/m (for example, a 60/63/66 N/m spring). Of note, they also say that “extreme progressive” springs are a mistake for most riders! Unless you plan to use it for Supercross, they just prevent you from using all travel effectively and make the shock harsh. They finish the process with a micro-finishing technique on the shock shaft (and fork tubes) to improve lubrication of the sealing surface and thereby reducing friction. 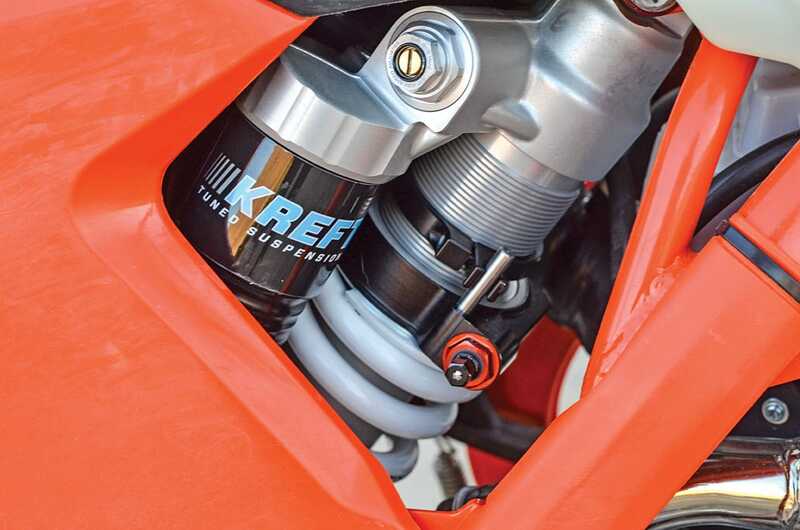 Kreft set up our shock with an X-Trig preload adjuster, which makes adding or subtracting preload adjustments simple with nothing more than a T-handle. Our initial ride on the Kreft suspension produced grin-widening results. We went on a six-hour march in some incredibly hostile terrain—rocky, loose, whoops, embedded boulder zones, and dramatic ascents and descents—and came away hugely pumped with the newfound suspension abilities on the 300. Being balanced helped in all facets, because we no longer fought the front end for control. The fork’s ability to absorb low-to-mid-speed trail carnage was a monumental improvement, and quick changes via the re-valve control knob let us stiffen the action for higher-speed whoops and severe rocky downhills. Enduro Engineering’s add-on spark arrestor is a superb piece that makes it legal in the forest and their rear shark fin protects the rotor from abuse. 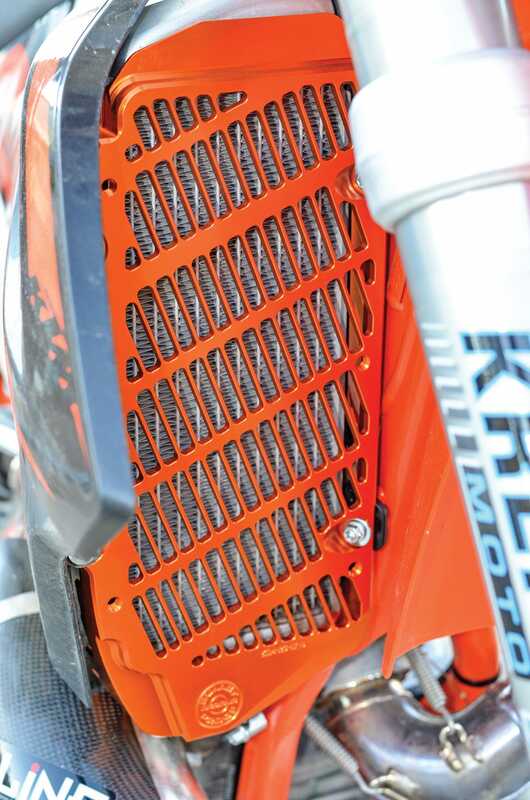 Bullet Proof’s radiator guards are sano, flow air nicely and guards the sensitive coolers. Kreft set up the valving and spring rate for the bigger guys, and to be honest, they made only small one-to-two-click changes. It’s that good. We let our resident extreme rider Kyle Redmond ride it, and he, too, came away impressed with the balance and the great fork action—and he never set a clicker! When he rode it stock, he felt very uncomfortable with the fork dive and harshness on speedier hack zones. The Kreft shock seems to settle more and is a strong performer in rocks and chewed-up terrain. It keeps the rear wheel clawing for traction, but initially seemed to blow through the stroke on a log hit or a high-speed curb. We added a quarter-turn of high-speed compression to the shock and this fixed it. Kreft says to set the sag at 115mm, so we bumped ours up to 108–110mm, and this helped a bit in corners without making it ride like a stinkbug. Overall, there’s a great feel, a strong traction factor and good stability in fast, rough terrain; another high note for our project KTM 300.